The richness of an 16-th century enthusiast. 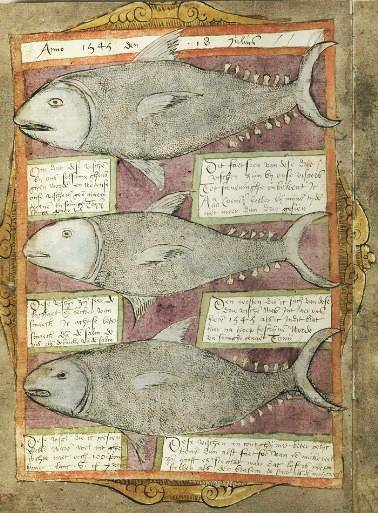 The Dutch fish-auctioneer and official beachcomber Adriaen Coenen wrote and painted beautiful hand painted books on marine species. With his knowledge of both marine species and the modern literature of his time he produced unique documents that give insight in the 16-th century points of view. In rich illustrated books he combined early scientific knowledge with medieval fantasies in a most natural way. For marine ecologists his own observations on fishes, fisheries and trade in the 16th century form the most valuable part. Want to know more? Our paper in Fisheries Research reveals this part. An outburst of Dutch marine biology in the 18th century. In the 18th century the Dutch physician Job Baster studied marine life in the Oosterschelde near Zierikzee in the south of Holland. His work resulted in a book with fine illustrations of marine animals and their microscopic details. His example was soon followed by the merchant Leendert Bomme and the civil servant Martinus Slabber. More about Baster, Slabber and Bomme and their books. On this site you can not only look at the illustrations made by Baster and Slabber but also find extensive information about identification of their species in past. An update on the identification of species is carried out by Godfried van Moorsel and me, consulting specialists of the different taxa. More about the sites the places where found.